This question came up recently with a client that had both Non-deductible contributions in an IRA mixed with Pre-tax (deductible) contributions. When you take a withdrawal how much is taxable? It is called the Pro-Rata rule with the IRS and you have divide your after tax contributions by the entire retirement balance to figure out non taxable basis. Does the news affect the markets? “Another week, another headline out of DC as the Chief Economic Advisor, Gary Cohn resigned. Last week it was tariffs, this week a departure, next week it will be something else. Why does news sometime matter and sometime not? The market is made up of humans around the world that trade based on news flows, but the only thing that matters is where the market stands at the daily close. Sometimes news events will matter but many times it is simply noise for short term traders to try and capitalize on. There are many in the academic field that will try and tell you markets are “efficient” meaning that they price in all known and unknown information and that no one has an edge. However, any time you have something controlled by human beings, there is no possibility of it being fully efficient. There are to many opinions, biases and emotions at play for the market to fully price in everything. That is the reason we get gap downs and gap ups on various news flow. At the end of the day it isn’t the news that matters, it is the markets reaction to the news that matters. I’ve been at this long enough to learn to be skeptical of the news, yes I see the headlines but instead of letting it steer my biases, I simply want to see what the markets reaction to it is. Is the correction over, or is there more? 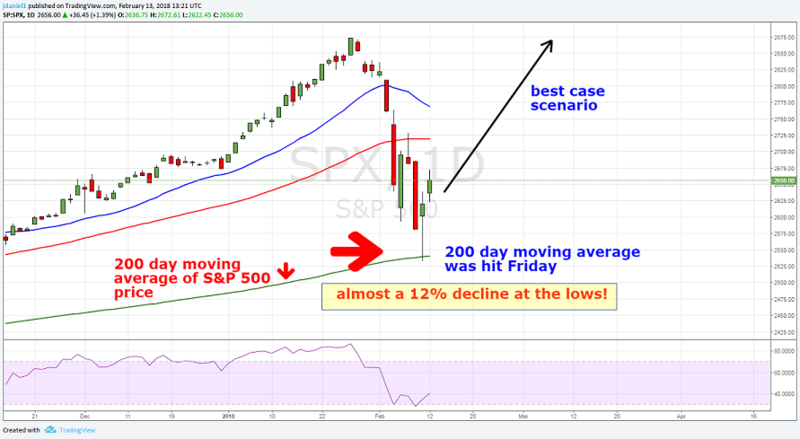 The long awaited market correction came with a vengeance the past two weeks, and now the question becomes is the coast all clear? 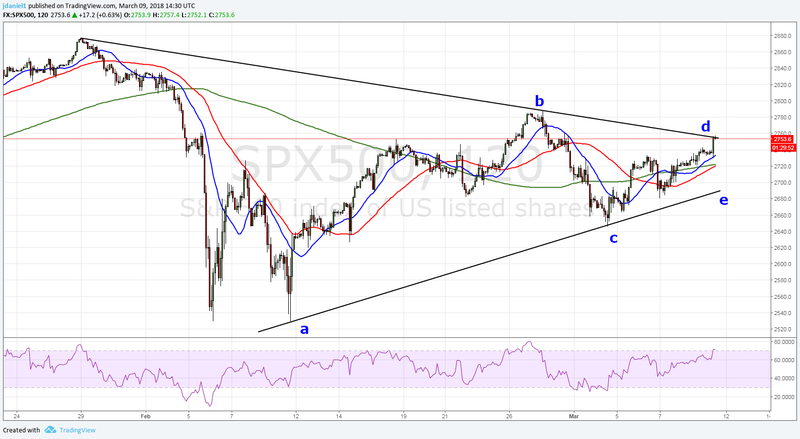 Before we look at possible scenarios let’s discuss what finally triggered the rapid selloff. Lurking beneath the strong stock market rise in 2017 were slowly rising interest rates. With the strong economy, robust rising market and very low unemployment the recipe for inflation suddenly kicked in and rates began to break what many saw as a decade plus downtrend. This sent a sudden shock through the market that maybe the Fed is behind the curve by keeping interest rates artificially low for to long. Being late to correct this could mean inflation takes off and then the Fed must rapidly raise interest rates to counter that. So the market had a momentary panic as this reality came to the surface and dropped over 10% in two weeks. Why did it all of a sudden appear in February? Who knows, maybe the market participants suddenly became realists all at the same point. Could that scenario play out? Of course and that is why you put some cash to work when the markets pull back to prior support levels. HOWEVER, there is another scenario that could come into play if this bounce stalls out. And this is the one you need to be prepared for as it could cause some major anxiety. What I’m going to be watching for in the next few days / week will be the strength of this bounce. If it stalls around the area highlighted below, there is a potential for one final move lower that is approximately the same point drop as we just experienced. 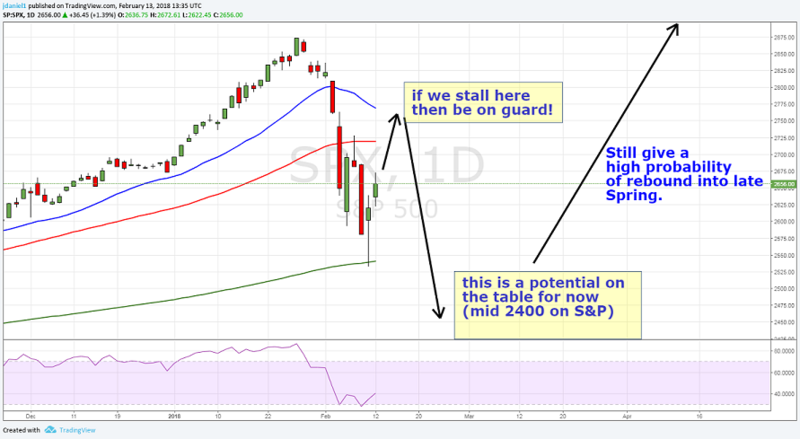 Potentially down to the 2450 level on the S&P. That would clear the decks and put enough fear in the market that we could have a sustainable run through early Summer. Is it possible? Yes. Is it probable? The next few days will shed more light on that question. Just know that anything can happen in the market. Nothing is impossible. A Life Changing rally on tap? Why hire a CFA to manage your wealth? The interest rates on 10 year US treasury bonds have really shot up this fall. We were at 1.4% in July and now at 2.4%, quite a large jump and a level not seen since 2015. By comparison other developed countries like Germany (blue line) and Japan (red line) are much less. The spread has widened, will the others play catchup or will we see a retreat in US yields soon? 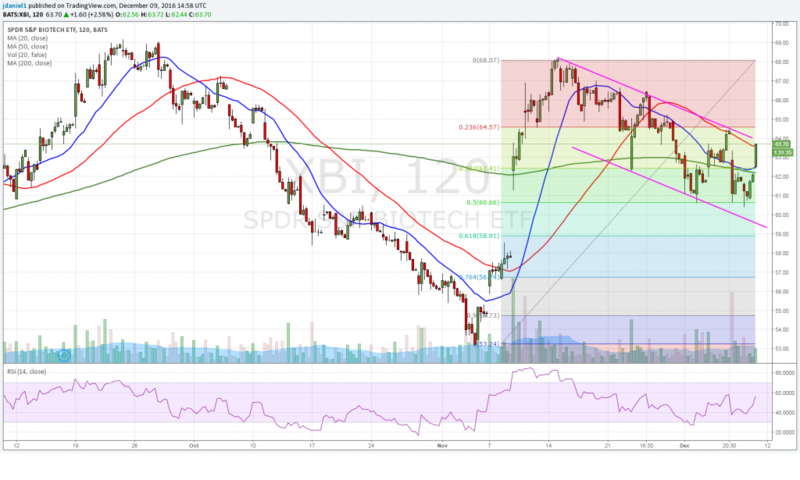 Biotechs are starting to look very interesting here……. 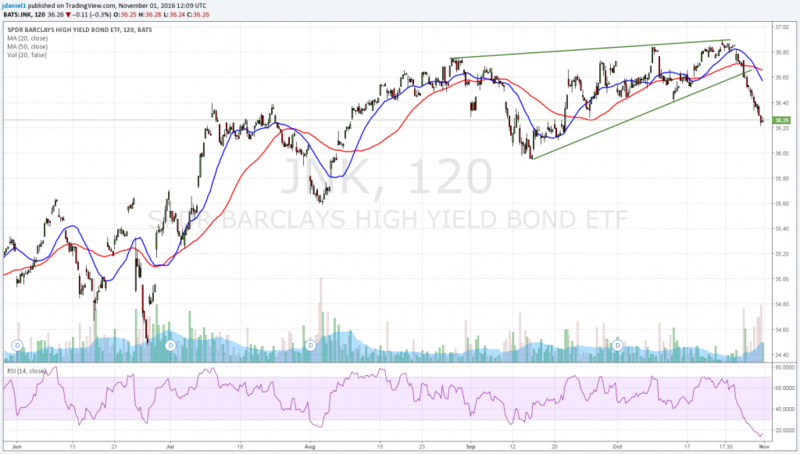 Not sure where high yield bonds are heading (junk bonds) but we’ve had a nice run this year and it was time to take profit. I can’t get a good read on High Yield here, so with it falling out of this wedge I took clients out on Friday morning.